A step-by-step guide on how to install a thermal expansion tank in the home water heating system. How does it work and why it is important to install one? The thermal expansion tank is the device that is used in potable water and hydronic space heating to protect the system from excessive water pressure. The expansion tank or vessel is designed to receive a volume increase of the heated water, reduce the pressure and protect the system from failure. The device contains the air membrane (diaphragm), usually made of rubber, which is pressurized with air on one side while on the other side is water from home plumbing. As the water temperature and pressure increase, the air bladder expands making room for water expansion from the water heater. As the temperature of water and pressure start decreasing, the diaphragm goes back to its design position returning the cooled water to the heater. The expansion vessel is used in closed-loop systems where the flow preventers and check valves are installed, and since the expanded water doesn't have anywhere to go, the expansion tank is there to take the extra amount of water. Note: When water is heated from the temperature of 50 F to 120 F, the volume of water increases approximately by 2%. 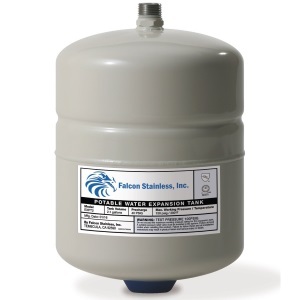 The expansion tank must be appropriately sized while the installed capacity depends on the size of the water heater. One of the most common problems when the expansion tank is not installed, and the pressure starts building up, is water dripping from the temperature and pressure relief valve (TPR valve). Due to the higher pressure, the expansion could affect the normal operation of the valve, waste the energy, shortened unit’s life and become a potential safety hazard. Since water is considered non-compressible, a much bigger problem occurs due to the extremely high water pressure, and these include bulging water heater, tank rupture, dislocated air vent or gas and water fittings, leaking and other. Check the water pressure in your home. It should be close to 50 PSI. If it is higher than 80 PSI install the pressure reducing valve. Check the pressure of air inside the thermal expansion tank. The pressure should be equal to the maximum water pressure in your home. Use the hand pump to increase the air pressure if needed. It is recommended to install the thermal expansion tank on the cold water line, horizontally and close to the water heater. Use the threaded T- fitting, Teflon tape, and pipe wrench to make the watertight connection. Remove the trapped air by opening the hot water tap. We will assume that the expansion tank is using the diaphragm, separating water and air. It is installed on the cold side of the water supply line. Tap on both upper and lower part of the tank. When you tap on the upper part, it should sound as hollow. If you hear a thud sound, then the upper chamber is filled with water indicating that the diaphragm is damaged. You can also check the temperature of the outside tank surface, by touching the top and bottom of the device. It should be cold on the tap, where the air is located, and warm on the bottom, where warm water from the tank is stored. Use the manometer to check the pressure inside the expansion tank. The reading should be per manufacturer’s specs. If the pressure inside the water heater tank is high and expansion tank is not working correctly, the TPR valve will be dripping. Did you know that you can use an online calculator to calculate the size of an expansion tank? Most of the expansion tanks for home use have a capacity between 2 and 5 gallons. If you are not sure about the size, it is better to install an oversized expansion tank. If you install a smaller expansion tank than what is required, the excess pressure will cause relief valve discharge. Installing an expansion tank is a DIY home project that can be done by any handyman for a short period. They are not expensive to purchase – they cost somewhere between $20 and $100. Also, for installation, you need some copper pipes and material for soldering or galvanized pipe and fittings. No matter if the house you live in is with the closed or open water supply system, install it, as the device will protect the system not only from thermal expansion and high pressure but permanent damages to the heater and heating system.